Many years ago, India was considered the epitome of wealth and luxury. One only needs to read about the regal empires of this great nation’s past to get an idea of the stylish surroundings its inhabitants enjoyed. The good news is that India’s wealth and luxury is not just a thing of the past. Many of the royal castles, scenic accommodations and luxurious transportation methods still exist today. What is more, many of them have been converted into hotels and accommodations for those who wish to explore “Exotic India”. India Luxury Tours can take you to India’s past opulence and give you a glimpse of the luxurious lifestyle once reserved for the country’s royalty and elite. In order to enlighten you about what luxury tours in India are all about, I will briefly describe 2 luxury tours in India that I have personally participated in and have been inspired by. The 2 India Luxury Tours presented below are not only endorsed by me, but have also garnered the approval of my clients who have participated in them. I believe they are a good introduction to what luxury tours in India can provide for tourists who like to travel in style. 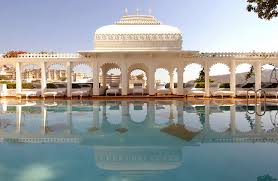 This particular India Luxury Tour takes place in a hotel, TheTaj Lake Palace, and is a destination in and of itself. If you never even go anywhere else in Udaipur after you have checked in, you will not feel as if you have missed anything after you have checked out. The Taj Lake Palace in Udaipur, India was built in the 17th century and was later converted into a hotel for those visiting Udaipur (the city of palaces). It is situated on an island, right next to Pichola Lake, and gives the impression of a “floating castle” – a remarkable sight to behold! Its elegant design makes it one of the most beautiful pieces of architecture among the many palaces scattered throughout Udaipur. The hotel is built in white marble and sports a host of elegant courtyards. fountains and gardens. Even arriving at the Taj Lake Palace in Udaipur, India is a wonderful experience. The only access to the hotel is by boat, and all guests are provided with a lovely “gordon” to sit in while they take in the lovely scenery of the lake and its surroundings. As was said before, the India Luxury Tour to the Lake Palace Hotel is a destination in and of itself because it reveals the wealth and luxury synonymous with the royal structures and accommodations of Udaipur’s past and present. And the best part is, you get to live in one of them during your visit. This is definitely one of the luxury tours in India you should not miss! Arguably one of the most opulent of all the “transportation” luxury tours in India, the Gems of India Tour takes you on a fascinating journey through the “Golden Triangle”, a route which showcases many scenic sights within Delhi, Agra and Jaipur (including the world-renowned Taj Mahal). 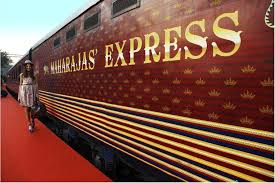 The Gems of India Tour takes place aboard the nostalgic Maharaja Express Train (also commonly referred to as the Maharajas’ Express). This particular India Luxury Tour pampers you from start to finish. You can wine and dine, rest and relax, or watch your favorite show or movie aboard one of the most regally-adorned trains in the world. Along with enjoying the splendours of luxury transport, you will also get to see all of the wonderful tourist sites within three of the most beautiful and historic cities in India – Delhi, Agra and Jaipur. What more could you ask for? The Gems of India Luxury Tour is in my estimation one of the most comfortable and relaxing ways to travel while previewing the wealth and grandeur of “The Great Subcontinent”.